Sympathisers from all sides and parties, from newbies to political addicts, whether Bernie-or-bust supporters or GOP voters, or somewhere in between, can now take part in one of the most compelling and controversial election that America has ever witnessed. 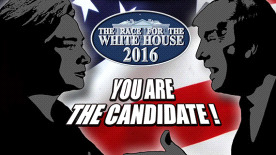 Candidate players can enter the 2016 presidential race as an actual contender for the White House, or you can join the political fray as real world candidates “Hilda Tilton” or “Ronald Drump” with animated 3D faces and hours of voiceovers by impersonators. You will need to act and react – swiftly and decisively – just like in the real 2016 campaign Players have total control over their candidacy so you need to deal with lots of face-paced decisions. Candidates establish headquarters, travel the country, set up rallies, deal with super PACs, manage the campaign budget, make TV appearances in debates, and build TV and ad campaigns. Candidates also get to make nearly two hundred campaign promises, but be careful – those promises will impact the deficit! And do not forget to satisfy lobbies, religious communities, or ethnic groups as their votes will be decisive. Yes, there’s the fun, slimy stuff, too… Dirty tricks have long been a staple of national politics, so The Race for the White House includes spreading scandalous rumors, arranging to have competitors’ campaign cash stolen, giving kickbacks to attract supporters, and sabotaging opponents’ meetings…but be careful because these slimy tactics might backfire and cost you the election. Low blows: rumors, fraud, discrediting your opponent... that's politics, too! Continuously appraise statistics and poll results on participating candidates on the game's website! Copyright Eversim, all rights reserved.